Picture a potful of lipstick pink flowers, each with a striking trumpet-shaped labellum enhanced by delicate frilly edges. No, I’m not referring to a cattleya but to Pleione formosana, the most common of the pleione species grown in Melbourne. P. formosana is a delightful and easily grown orchid, particularly for the new grower. It is hardy, requires a minimum of attention and best of all grows cold. It is close to being the ideal orchid! P. formosana from Taiwan (previously Formosa), China and parts of the Himalayas and South-east Asia, has an annual growth cycle reflecting a monsoon pattern of wet summers and cool dry winters. Pleiones flower in spring from the previous season’s mature pseudobulbs. I have found that flowers of P. formosana grown in shade-house conditions are at their best in late September-early October, just at the time of many of our spring shows. With some protection from strong winds and rain, flowers will last around two weeks. It is a different proposition for flowering plants kept indoors. About one week is all that you can expect in an air-conditioned or heated atmosphere, such as in our large shopping centres. The growth cycle recommences with the completion of flowering. The new pseudobulb develops quickly as the single leaf matures and some weak fertilizer at this time will help produce a nice plump bulb. By autumn the old, previously flowered bulb will start to darken in colour and eventually become quite soft and spongy. This is a natural part of the growth cycle and is no cause for alarm. As P. formosana is deciduous, leaves will also start to turn yellow-brown by early May and will eventually fall as the colder winter weather sets in. 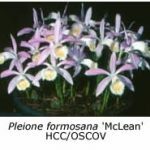 The pleione plant is rather smallwith its single leaf being approximately 200 mm long and 50 mm wide, and of similar shape, colour and texture to the leaves of a lycaste. The leaves attract some leaf chewing grubs, snails and slugs, but otherwise appear largely pest-free. A few snail pellets and diligence helps to control these pests. If the potting mixture is sound and the dormant pseudobulbs are not too cramped, the bulbs can be left in the pot for spring flowering and a further growth cycle. Otherwise, the pseudobulbs should be knocked out of the pot in early winter. These are cleaned up by removing the old shrivelled pseudobulbs, together with any husks and dead leaves, and either repotted in fresh compost or stored in a dry place in an open mesh bag and repotted prior to the new growth buds appearing in late winter. When repotting try to group the mature pseudobulbs in the pot in order to provide a massed display of flowers in the spring. Firstly, trim the old roots to about 30 mm and use what remains to anchor the bulbs in the compost. The bulbs should be planted on the surface of the mixture no more than 10 mm deep, ensuring the emerging buds are not covered. While many growers use shallow pots and a gravelly potting mix, what is essential is excellent drainage. 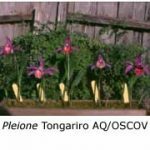 Pleiones like plenty of water during the summer, but avoid sodden conditions. Some chunks of polystyrene in the bottom third of the pot will help drainage. I have found a 3:1 mixture of old shredded tree-fern, fine bark, and coarse gravelly sand makes a suitable compost. A small amount of leaf mould or peat moss is also helpful in holding moisture over summer and adding fibre to the mix. Six-month Osmocote® pellets and/or Hoof and Horn® or similar can be added to provide additional nutrients. The repotted pseudobulbs should be watered and then placed in a dry position prior to their flowering in the spring. Pots can be kept dry throughout winter by placing them in a polystyrene fruit box under the north-facing eaves of your house. This aspect will provide good light while protecting the plants from strong winds and rain. Recommence light watering when growth starts and return the pot to the shadehouse or bushhouse. As well as one or more pseudobulbs being produced during the growing season, two to three small bulblets are likely to develop on the top of the old pseudobulb. These bulblets can be collected in late autumn and planted together in a separate community pot. As the bulblets take around three years to reach flowering size they can be left in the pot until reasonably large sized pseudobulbs are formed. 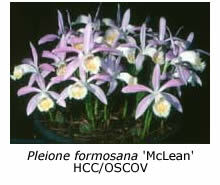 P. formosana has a number of varieties which provide a range of flowering times and colours. P. formosana ‘Alba’ and ‘White Beauty’ are nice early whites, while ‘Oriental Jewel’, ‘Oriental Splendour’, ‘Serenity’ and ‘Julie Collins’ provide shades of pink through to darker mauve/purple. 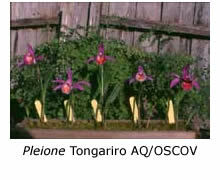 Various hybrids with P. formosana in their parentage are also available. P. Versailles ‘Buckleberry’ is a fine example, being a deep, mauve-pink colour. Interestingly, P. Versailles (P. formosana x P. pogonioides), the first of the pleione hybrids, was only registered in 1966. More recently new hybrids such as P. Wenya, P. Burrator, P. Diller and P. Europa, which have species other than P. formosana in their parentage, have been registered and these would be well worth-while growing.